Sailors on ships like the USS Alamo could have been exposed to Agent Orange during the Vietnam War but have had trouble verifying their benefit claims. Sailors on ships like the USS Alamo spent days and weeks in the territorial waters of Vietnam, where they could have been exposed to the toxic herbicide Agent Orange — linked with various health conditions including Parkinson’s disease and cancer. Until recently, they were not eligible for the same health benefits as soldiers who served on the ground or patrolled inland rivers, and who later developed health problems associated with Agent Orange. However, a federal court ruled Tuesday that the Department of Veterans Affairs must extend those benefits to those who served offshore. A bill considering the issue, called the Blue Water Navy Vietnam Veterans Act, also came up in the last Congress, but did not pass in the Senate. Even with Tuesday’s ruling, one key obstacle stands between veterans like those Alamo sailors and the benefits they need. How can families — and the VA officials assessing their claims — prove that a particular ship was in the Agent Orange exposure zone, defined by the legislation as within 12 nautical miles of a boundary off the coast of Vietnam? Currently, that process involves looking through handwritten deck logs or other archived documents to prove eligibility. It’s a time-consuming process for veterans, their families and the VA.
That’s where Brian Harris, Jackson Sutherland, Alexi Himarios and Matthew Jacobs come in. They knew there had to be a better way. All four are students in the University of Virginia’s new Master of Science in business analytics program, which welcomed its first class this year. The yearlong, Washington, D.C.-based program, run jointly by UVA’s Darden School of Business and McIntire School of Commerce, allows students to continue working full-time while learning how to harness the power of big data and apply it in their field. When Harris, a major in the Army Reserves, heard about a Tableau Student Data Challenge dealing with this topic, he knew it would be a great opportunity for his classmates to put the skills they were learning in the MSBA program to good use. Harris reached out to classmates and together the four students entered and won the contest, held by software company Tableau. Unwilling to stop there, they continued expanding and perfecting the tool they developed and briefed VA officials on its use. One official, upon viewing the tool, “said it could do in minutes what might otherwise take weeks,” Sutherland said. 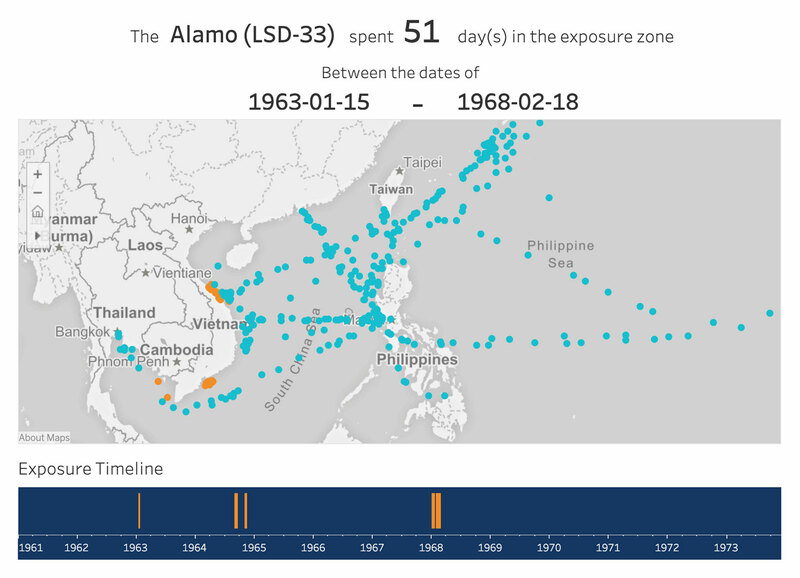 This screenshot shows the movements of the USS Alamo, with the orange dots showing when the ship entered the Agent Orange exposure zone. Sailors who were on board at that time could be eligible for health benefits. To make all of that information accessible, the team spent a Saturday digitizing handwritten ship logs, which are stored in the National Archives and record the day-to-day coordinates of each ship. So far, they have digitized records of 24 ships, with approximately 750 remaining. They are reaching out to veteran’s groups to help with some of the digitization, and also hope to use machine learning technology — something they are studying in class right now – to more quickly upload records. Jacobs, a Navy veteran, said the tools they are developing fit in with a broader emphasis on data and data analytics in the military. The human impact, Jacobs said, provided more than enough motivation for the team to work on this project, even outside of class and while balancing full-time jobs. Darden professor Casey Lichtendahl, who teaches in the MSBA program, called the project a showcase for what the program is trying to accomplish, because it focuses on “translating” data science into information that laypeople, businesses and policymakers can use to make important decisions. Sutherland said that balance of business and data was exactly what drew him to UVA in the first place. Right now, students are working on a case study for Hilton Hotels & Resorts, examining employee retention and looking for ways to reduce attrition. At the end of the unit, they will present their findings directly to Hilton’s human resources team. In the months to come, the four classmates hope to formalize their commitment to “data for good,” as Harris called it, by finding ways for each subsequent MSBA class to lend their skills to a cause or organization. For now, though, they are focused on getting the VA to use the tool they have built. That could happen soon, if Wednesday’s federal court ruling is not appealed to the Supreme Court, or if Congress passes the legislation. Whenever it does happen, they want to be ready. This story originally appeared on UVA Today.